Just in case civilization collapses. The lander was built by the Israeli startup SpaceIL. It’s carrying a high-tech disc containing 25,000 books, a full copy of Wikipedia, and information on understanding Earthly languages — the equivalent, all told, of a 30 million-page tome. Once it’s there, the archive — dubbed the Lunar Library — is supposed to sit on the Moon for billions of years, preserving humanity’s knowledge and history long after we’re gone, according to CNET. 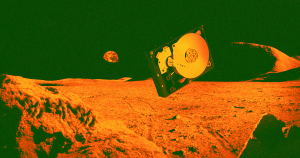 The archive, in the form of a specialized disc, hitched a ride during a SpaceX Falcon 9 launch on Thursday. A test version flew alongside that Tesla Roadster that Elon Musk launched into space, according to CNET. “The idea is to place enough backups in enough places around the solar system, on an ongoing basis, that our precious knowledge and biological heritage can never be lost,” Nova Spivack, co-founder of the Arch Mission Foundation, which is the organization that made the Lunar Library, told CNET. Now, should humanity fail to prevent climate change, or should any other end-of-days scenario occur, the knowledge and accomplishments of the world can carry on without us. Presumably, any future civilizations would just have to figure out space travel — and somehow locate one of the Arch Mission’s data caches — to access the archive.